This is a really easy and quick dessert to put together but it’s also seriously addictive. It's an odd and very old recipe. It must be old because I remember eating a version of it as a kid. I often hear TV chefs telling us that, although they were poor as kids, the mothers and grandmothers would always conjure up wonderful meals out of next to nothing. That wasn’t my experience. Most mothers and grandmothers were just too busy or too tired from working every day to cook anything very much at all. But I do remember one or two dishes and this is my attempt to recreate a pudding that the mother of one of my friends made. To be honest, I’m not sure it’s a very accurate recreation (it was a very long time ago) but I’m pretty sure that cake and marshmallowy meringue were involved somewhere. My friend’s mother was from Scotland and so I always assumed that this odd little dish was from the same country. I’ve only fairly recently realised that it’s actually very like the venerable American dish ‘soda cracker pie’ and so how it came to the streets of south London in the days before the Beatles is anyone’s guess. For this version I used a slice of a banana and dark chocolate cake that my wife baked, which worked really well, but other types of cake will do. Madeira cake, lemon cake, almond and other nut cakes would all make excellent substitutes. The white chocolate is optional but very nice, of course. Whipped cream is the obvious thing to pile on top, but the pie is very sweet and I prefer the slight sharpness of thick yoghurt. However, I do confess to adding a little chocolate Philadelphia to my slice as well. I reckon that you can get 6 to 8 restrained portions from this amount, but it’s ridiculously hard to be restrained. Incidentally, if you leave out the cake component, this recipe is similar to the equally venerable ‘forgotten pudding’, which is also an outrageously addictive treat. Nigella has revived that recipe and her version can be found here. 25 g white chocolate, chopped into very small pieces. Thoroughly butter a cake tin – I used a 30cm square tin. Preheat the oven to 170°C. Whisk the egg whites to the soft peak stage. Add the vanilla and cream of tartar. Continue whisking while gradually adding the sugar until the whites are stiff and glossy. Whiz the cake into crumbs in a processor. Fold the cake crumbs and chocolate into the egg whites. Place the mixture into the tin, levelling the top. Bake for 35 – 40 minutes until the top is crispy and golden. Allow to cool in the tin before carefully removing – it’s a fragile thing. The pie will sink in the middle as it cools; this is normal – it’s where you add the creamy bits. And finally a picture of me at roughly the time I enjoyed my first cake meringue pie – just to prove how old I am, I suppose. 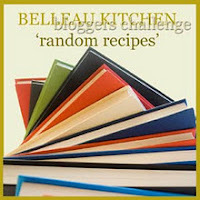 For the Random Recipe challenge this month Dom of Belleau Kitchen has asked us to do something a little different. Instead of cooking something from our books, he wants us to photograph the books instead. Well, here is my main collection of cookery books arranged in no real order at all in an oak cabinet in the kitchen. The cabinet was built by a previous owner of the house, probably as far back as the 1930s. The oral history is that he was a carpenter who worked on local churches and made bits and pieces for his house with (hopefully) surplus oak. He also made the brass fittings by cutting them out of disused name plaques. Some of the brass in the kitchen is cut from the nameplate that was once displayed outside the door of an elocution teacher. Despite mislaying and giving away quite a few books over the years, there are still too many for the church carpenter’s cabinet. So upstairs there are also a number of books that sit on much more modern shelves, although I don't think they're from the well-known Swedish store where you queue a lot and are forced to eat meatballs. Clearly that’s too many books (or so I’m reliably informed). As a result, this year I vowed that I would not shop online or visit bookshops to buy any more cookbooks. I have kept that vow, but unfortunately I didn’t promise that I wouldn’t go to charity shops and sales. And so there is a small but growing pile of books that I’ve gathered this year in the name of charity and, so far, I’m not quite sure where I'm going to put them. Funnily enough, some of these books were purchased at a sale in the local church where I noticed a distinct similarity between the oak in my kitchen and some of the pews. I’m saying no more. Around five or six years ago I got a little carried away (well, actually very carried away) at the Pick Your Own farm and came home with far too many gooseberries for the classic sauces and jams that I wanted to make. Looking through some of my cookery books for inspiration I found a recipe for a ‘Spicy Gooseberry Sauce’ in a Sainsbury’s Fish Cooking book published back in the 1980s. This was a little different to the classic, simple gooseberry sauces for fish. Essentially, it’s a good old-fashioned devilled sauce with a mix of ingredients more reminiscent of chutney than a smooth sauce. The British tradition of devilled sauces often seems to be on its last gasps and I think that’s a great shame. I made a version of the classic Gubbins Sauce a little while ago but this fruitier sauce is at least as useful. I’ve developed and complicated the recipe since then but, despite a long list of ingredients, it’s really easy to make and very versatile. It’s good with oily fish such as mackerel but it’s also very pleasing with chicken, duck and especially pork. It can even be served hot or cold. I usually make a fair bit of this sauce while the gooseberries are ripe for picking and freeze it in small batches. It’s intensely flavoured and 100 – 125 ml of sauce per person is normally plenty (unless you’re really addicted to the flavour like me). This sauce contains some tarragon vinegar and so a quick seasonal digression on that subject first…..
It’s possible to make a multitude of differently flavoured vinegars and many of them are very worthwhile but there are two that have proved especially useful to me throughout the year for sauces, marinades and dressings: blackberry vinegar and tarragon vinegar. There are a number of ways to make tarragon vinegar but I use a very simple method. 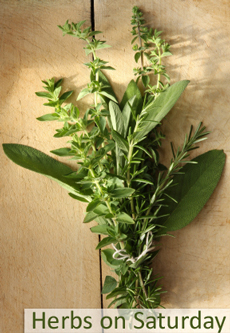 Pick three long, fresh stems of French tarragon, wash and dry them and put them into a 500ml bottle of white wine vinegar. Shake the bottle a bit and put it in a cupboard for a week or ten days, shaking occasionally if you remember, until it seems to have the right amount of herby taste. Filter the vinegar and put it in a pretty bottle. And that’s all there is to it. You can put a fresh sprig of tarragon in the bottle, which looks nice if you’re giving it as a gift, but has the disadvantage of making the tarragon flavour stronger over time and so can make it tricky to judge how much to add to recipes. That’s the end of the digression and so back to…. The amounts given here will make around 1250 – 1300 ml of finished sauce. Wash the gooseberries, top and tail them if they need it and remove any damaged or unpleasant bits. Then simply put all the ingredients together in a non-reactive saucepan and bring to the boil while stirring frequently. Lower the heat and allow the mixture to simmer very gently, uncovered, for 30 – 40 minutes until the gooseberries have collapsed and the flavours have mingled. Allow the mixture to cool a little and then liquidise it. Work the sauce through a fine sieve and that’s all there is to it. (Told you it was easy). Taste and adjust the sweet and sour balance with a little sugar or vinegar if it seems to need it. I know that the tarragon is only a small (but important) part of this finished sauce but nonetheless I thought I’d enter this into the July Herbs on Saturday blog challenge created by Karen from Lavender and Lovage and hosted this month by Vanesther from Bangers and Mash.